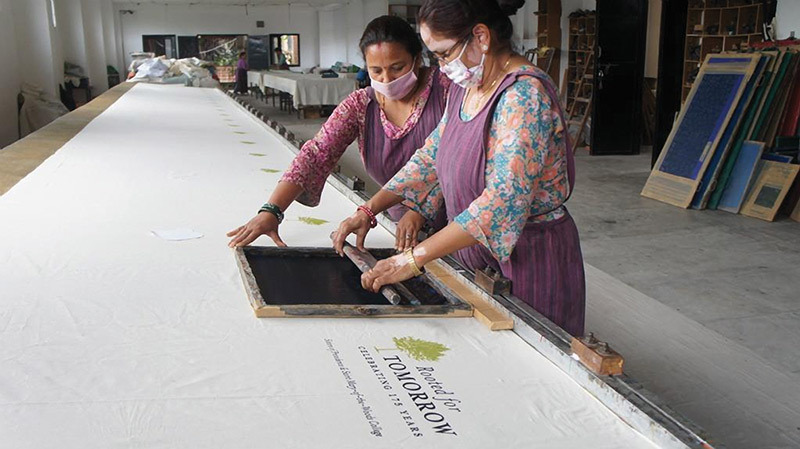 These two Nepalese women work together to screen print bags for Linden Leaf Gifts. Radha Shrestha. Sopha Sriwichai. Sakuntala Pradhanang. Puangpaka Tuisamut. These are names of just a few of the people who supply products to Linden Leaf Gifts, located in Providence Spirituality & Conference Center at Saint Mary-of-the-Woods. Does it seem strange that a little gift store in Indiana carries merchandise from crafters in such exotic places as Thailand, Nepal and Africa? The reason is very intentional. It is because Linden Leaf Gifts is a store that worries less about keeping the lights on and more about how to bring light into the lives of marginalized people. As a ministry of the Sisters of Providence, Linden Leaf Gifts measures success a little differently than most retail stores. Success is derived also from the difference it can make in the lives of people that provide the unique products sold there. That’s why, in addition to Saint Mother Theodore Guerin and Our Lady of Providence souvenirs and remembrances and sister-made products and White Violet Center for Eco-Justice items, visitors can also find a large collection of fair trade merchandise. According to the Fair Trade Federation fair trade is “…an approach to business and to development based on dialogue, transparency, and respect that seeks to create greater equity in the international trading system. Fair trade supports farmers and craftspeople in developing countries who are socially and economically marginalized. These producers often face steep hurdles in finding markets and customers for their goods.” Many of these marginalized producers are women who would normally struggle to find opportunities to earn a fair and living wage in their country. Store Manager Ryan Sheehy recalls a story where Linden Leaf Gifts made a direct impact on lives. In April of 2015, Nepal was devastated by an earthquake that killed nearly 9,000 people. Shortly before the massive tragedy, Linden Leaf Gifts had placed an order with the Ganesh Himal Trading Company for screen printed bags celebrating the 175th anniversary of the Sisters of Providence. In October of 2015 Linden Leaf Gifts commissioned the first-ever fair trade Saint Mother Theodore Guerin item. 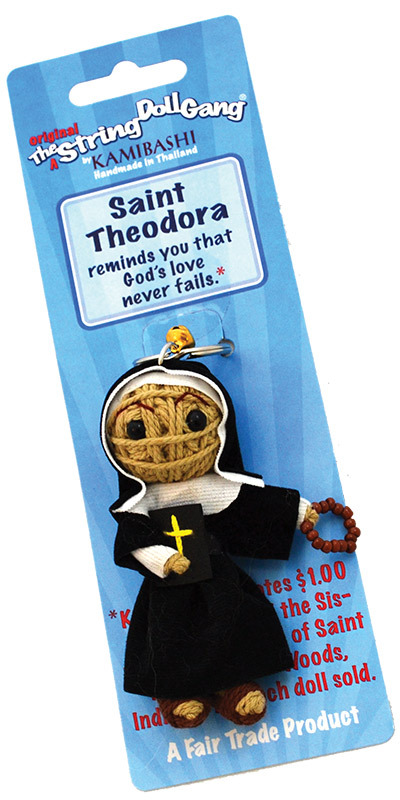 The “Saint Theodora String Doll” is from Kamibashi®, a fair trade company. The Saint Theodora String Doll is also part of the “Kamibashi® Cares” program which donates a portion of their sales back to the sponsoring nonprofit. For every one sold, Kamibashi® donates $1 to the Sisters of Providence. We as consumers are one link in a massive supply chain. When products end up in the typical big box stores, those who produce the items often have minimal benefits. When you support fair trade, the chain is much shorter. Creators of the product are fairly compensated for their work. Lives are changed. The next time you visit Linden Leaf Gifts — online at LindenLeafGifts.com or at Saint Mary-of-the-Woods — take a moment to look at the fair trade merchandise. Think about the people who made it. Think about how their lives are impacted. All because a little store in Indiana and you who shop there seek to bring some light into their lives.